Dutton Books for Young Readers, 9780525461524, 48pp. The first Grimm tale illustrated by 1998 Caldecott medalist Paul O. Zelinsky is once again available in hardcover. 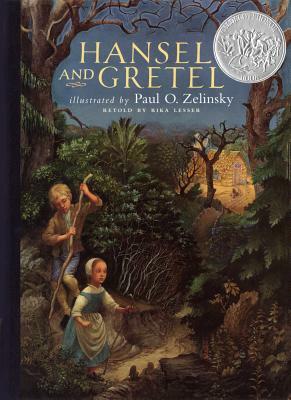 Originally published in 1984, Zelinsky's paintings for Hansel and Gretel are as compelling as his later work and will captivate readers with their mysterious beauty, emotional power, and brilliant originality. Each spread brings to life a world as rich and real as our own?detailed, colorful, sensual?yet filled with the unearthly shadowed magic of the Hansel and Gretel folktale. Whether portraying the fear and anguish of children abandoned by their parents, the delicious sumptuousness of a candy house, or the joy of being reunited with one's family, the artist captures the subtle nuances of emotion and the tactile quality of the physical world with exquisite accuracy and elegance.The hauntingly spare retelling of this perennial favorite by the poet Rika Lesser perfectly complements the vivid storytelling of Zelinsky's artwork. Once again this gifted artist gives us a unique interpretation of a beloved fairy tale, allowing us to both see it anew and rediscover its eternal truths. Rika Lesser is a poet and translator of Swedish and German literature.